Discotheques latest work performed in Auckland NZ at the Basement Theatre 2018 funded by Wellesley Studios, DANZ and through Boosted Campaign . "It's one of those things that when it's presented in front of you, you don't exactly pick it up, it's something in passing like an advert, an image, a way of living - but when you see it you'll appreciate it and maybe even laugh. What does it mean to be missing your lid? 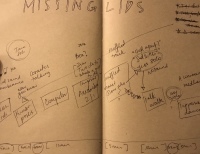 Inspired by a 1960's Tupperware Commercial, Missing Lids explores the funny and the not so funny times in life where you just have to keep going no matter how hard life gets. Three phenomenal female dancers tell the story. With excerpts of original sound, this dance theatre piece will stick in your mind for a while." Special thank you to Hamish McIntosh (poster/media design), Katrina Todd (Wellesley Studios), Jack Rowan Jenkins (sound).